The Portofino Comfort Collection 5-piece Fire Chat Set in Heather Beige is the perfect addition to your outdoor space to create a place for warmth and enjoyment on the cooler nights and days. Motion club chairs feature the same iconic contemporary design of the Portofino Collection, and include an integrated 360-degree swivel and rocking motion for deep relaxation. 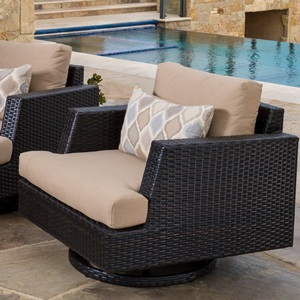 Durable aluminum frames feature hand-woven SolarFast® resin wicker that will withstand the elements, providing you with years of comfort. The fire table is amply sized with a height perfect for sharing a conversation. Motion chairs comfortably rock back and forth, and rotates 360 degrees. Propane tank drawer allows for easy access (recommended use with 20 lb liquid propane tank, not included). Minor fire table assembly required.